The first time I sat down to guide a women’s circle, I knew I’d come home. It was like I’d stumbled on the secret password that opened the door to sisterhood, and entered into a beautiful room. A room that was so human and so old. It was the beginning of my great and growing love for women’s circles. Looking back, the experience of that first women’s circle still feels rich and alive to me. And in that room I discovered there’s nothing quite like a group of soul sisters. Knitted together from the start, we connected in that unspoken way that often happens between women. And all of us were carried along by its rhythm. It was like digging into fertile soil that contained all of it at once: wisdom, connection, depth, creativity, light, shadow, healing, renewal, joy, curiosity. And so much more. Although I didn’t quite understand its full impact on me at the time, it was an in-the-moment experience of wisdom tending that led me here today. I grew up in a house full of boys, with three older brothers and no sisters at all. But it didn’t matter because I had my mom. She had a sister too, and they invited me into the deep, unspoken bond they shared. Sadly, my mother died quite unexpectedly just as I was about to enter into womanhood. Years of floundering followed, when worry and depression set in. For a long time I was lost, but eventually I healed. There were a few tastes of sisterhood along the way — in a community of actors, during my counseling studies, with a small group of newly-minted counselors after grad school — but I couldn’t recognize it because I didn’t even know I was looking for it. Then a strange thing happened when I got to mid-life. I began to miss my mom again and envied the connection some of my friends had with their mothers. As a therapist and coach I’d also witnessed many stories of difficult mother/daughter and sister/sister relationships. To make sense of my deep (and confusing) longing I turned to books, reading about the kinds of relationships women can create with one another. Two words entranced me: women’s circle. In an instant I knew this would be part of my work in the world, to marry the deep knowing of women’s wisdom with the life force of creativity. And on a warm September night in 2011, the final day of summer, the first women’s circle was born. Now, seven years later, I’m thrilled to begin this women’s circle in Sonoma County. 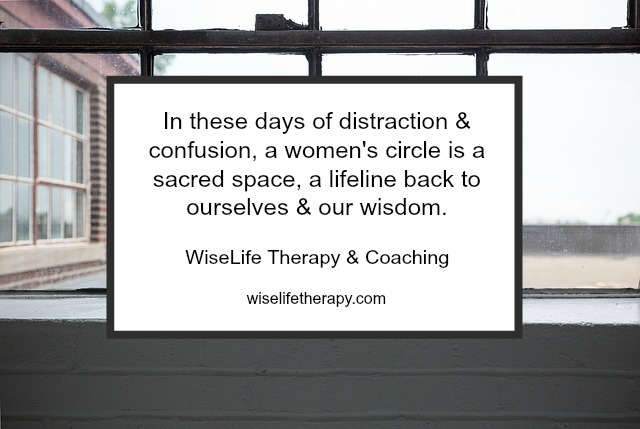 Wisdom Tending is a women’s circle, a place of support and connection, as well as an invitation to use personal/reflective writing practices to come home to your deepest wisdom. Women have been circling up for thousands of years. And there is a place for you here. We come together to listen and be heard. We share space, we offer an ear. And we write our way to wisdom together. In these days of distraction and confusion, the circle is a sacred space, a lifeline back to ourselves and our wisdom. And we show up just as we are. Perhaps the greatest gift of the circles I’ve been a participant in is that the circle always gives me what I need, no matter where I start. No matter what. We start on January 30, 2019. If there is a part of you that yearns to tend your deepest wisdom in the company of women, click below to learn more about joining the Wisdom Tending Women’s Circle in Santa Rosa. A circle of women may be the most powerful force known to humanity. If you have one, embrace it. If you need one, seek it. If you find one, for the love of all that is good and holy: Dive in. Hold on. Love it up. Get naked. Let them see you. Let them hold you. Let your reluctant tears fall. Let yourself rise fierce and love gentle. You will be changed. The very fabric of your being will be altered by this, if you allow it. Please, please, allow it.